Starring: Charles Bronson, Lisa Elibacker, Andrew Stevens, Gene Davis, Geoffrey Lewis, Wilford Brimley. To be fair to this movie, you have to place yourself into a different time period when violent exploitation films ruled. This was the 80’s. Over the top Drive-In flare owned the movies. 10 to Midnight is a Drive-In style, B-movie. It has all the trademarks of a late-night film. Over the top dramatic acting. Cheesy moments that linger and yet satisfied at the same time. 10 to Midnight is one of those classic Drive-In films, that yes had its problems, but still is able to be talked about, and loved in that Cult Status of entertainment. 10 to Midnight is one of the awesome B-movie films forgotten by time in the main stream of film lovers. The movie has garnered a Cult film status and deserves that title, and so much more. Thankfully, yet again, Twilight Time has given another amazing Blu-ray to all the fans of cinema. This was my most anticipated release, after hearing that this was going to be one of their Sept. products. I have seen this movie so many times. It’s one of my favorite B-movies; Drive-In style entertainment. I am a huge Charles Bronson fan. My favorite will always be, the Death Wish saga. I own every one of his films on VHS, and DVD, and now many of his films are coming out, or have already came out on Blu-ray. This was the one I was praying to be released. I prayed hard to the B-movie god, and finally was answered in all it's cheesy glory. This is a pivotal B-grade serial killer film, that leaves such a wonderful reality upon the watcher. Over acting in all it's fine glory. If you look past the flaws, it adds an old school style of Grindhouse cinema. This movie comes off as a horror style slasher. It shocks me that this film seems to never get the B-movie accolades it deserves. It truly is a fantastic cult status film. The tension, mixed with the over acting, is brilliant. The whole darkened, mysterious atmosphere of the film just begs to be watched. It's pure popcorn entertainment. One of my favorite laugh out moments is when the Boss at the office is informed that Betty has been killed. Her reaction and the reaction of the workers is high class CHEESE at it's best. I know at the time it was meant to be serious, but looking at it now, you can't help but laugh. Bronson came from a time of cinema when, Manly men owned the camera. The tough guy persona ruled, and operated a no holds bar attitude of dominance in film. There was a time when the male figure demonstrated a control of the character they were playing. Now days the white ghost teeth, slick hair, metrosexual, male figure becomes somewhat laughable in cinema, compared to the brutes of men in the 40’s, all the way to early 90’s cinema. What happened to the days of the sophisticated tough guys like, Richard Burton, Yul Brynner, James Cagney, James Coburn, Bronson, Eastwood, Hackman, Lee Marvin, Gary Cooper. How Hollywood has missed the mark in not creating the tough guy persona, just amazes me in all it's stupidity. Don’t get me wrong there are still tough guys, but the style, and approach has changed. The original tough guys did not have to demand your attention, they already had your attention, and Charles Bronson was that style. 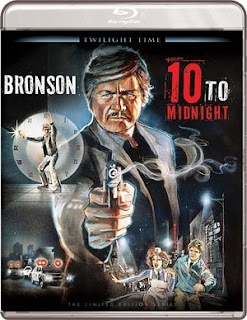 10 to Midnight is a crime thriller that demands your attention in the old style Drive-In entertainment. It’s a movie that creates a dark reality that never lets up. A brutal killer, a Detective, and many victims. What's so great about this film is Bronson, and the director had already worked on three other films. They knew each other. This style of bond in cinema is great. The director knows the actor. The director knows what the actor is good at. The actor knows the director. The actor knows what the director wants. 10 to Midnight has that complete reality. You can see how the film flows, and comes together easily to display the dark tale of murder, and the ability to solve it through Bronson’s persona. J. Lee Thompson was an important director that created so many wonderful tough guy films. They were more than just that basic tough guy style of film, because they had a unique substance to them, that gave a tight structured plot. Thompson used Bronson in the films, 1976’s St. Ives, 1977’s White Buffalo, and 1980’s Caboblanco, before 10 to Midnight. Thompson was a truly gifted director that had an eye for spell binding pieces of cinema. He was an Academy Award nominated director. He mastered the action great that he was nominated for: 1961’s The Guns of Navarone. Thompson in his lifetime of directing was nominated for Bafta Awards, Golden Globes, Palme d’Or Cannes Film Festival, and many others. His talent shined. He mastered such greats like the one and only 1962’s Cape Fear. One of my personal favorite guilty pleasures, 1972’s Conquest of the planet of the Apes. He also directed many lower budget; or films that has gone on to become cult following style cinema. 1981’s horror, Happy Birthday to Me, 1985’s King Solomon’s Mine, 1986’s Firewalker. He could direct Oscar worthy films, and he could direct Cheesy Drive-in Flare style of films. 10 to Midnight was not his last film with Bronson. They would go on to make later adventures, The Evil That Men Do, Murphy’s Law, Death Wish 4, Messenger of Death, and lastly Kinjite Forbidden Secrets. The lowdown of the plot in 10 to Midnight plays out like all your other, serial killer slasher films. Your main bad guy Warren Stacy (played by the naked, show me everything, Gene Davis), happens to be a repairman. A repairman that murders women. An easy reality to obtain victims. Stacy is often rejected by women, and this totally changes him. He is looked at as weird, different, or somewhat creepy by the women he wishes to ask out. Those women he wants, don’t want him, and he feels the women deserve to die because of that reality. Insert your main style heroes of the show, two detectives, Mr. Charles Bronson playing character Leo Kessler, and Andrew Stevens playing Paul McAnn. They are assigned to figure out the murders. Now there is a bunch of legal mumbo jumbo that happens, and Stacy basically gets off to murder more. Kessler is a veteran detective, that solves crimes the good old fashion way. Keesler see’s Stacy as what he is, a cold blooded murderer that the mumbo jumbo court systems are allowing to murder. Mix in Keesler’s daughter Laurie, played wonderfully by Lisa Elibacher, and the plot thickens, as the killer, and detective play a cat and mouse game to the end. As I have said, looking at it form an 80's Drive-In B-grade action film it works.Twilight Time did a great job, the film looks utterly amazing on this Blu-ray. Comparing it to the VHS and DVD I have, Twilight Time did a fantastic job that just blows me away at finally seeing this so fresh, mastered in sound, and image quality. This Blu-ray gives a whole new outlet to this awesome forgotten B-movie film. Something else that is brilliant about this serial killer film, and important in the annuals of Horror films, is that the killer is unlikable. He is what he is. It’s not Hollywood making the killer your buddy, or giving sympathy for the monster. No this was during the time you could figure out who the good guy was, and who the bad guy was. This was not like today, when the killer gets the boo who story, and the victim is looked down upon. 10 to Midnight is a film that knows what it wants to say, BAD GUY, GOOD GUY. 10 to Midnight was written by screenplay writer William Roberts. The original title of the screenplay was Bloody Sunday. Williams is most remembered for creating the famous TV show The Donna Reed Show, and also writing the script for the 1960 Western, The Magnificent Seven. Also one has to mention the flooring music by Robert O. Ragland, and amazing cinematography by Alan Greenberg. Both of these realities of the film is flawless. Greenberg has done some amazing cinematography for such films, (one of my personal favorites) 1982’s The Last American Virgin. The amazing sci-fi gem, 1984’s The Terminator. The often overlooked Vampire film, 1987’s Near Dark. The odd and weird yet memorable, 1988’s Alien Nation. He has had his hands in a lot of great films both small and large. All one has to look at is his vast career, Ghost, Terminator 2, Sphere, Rush Hour, and many others, from director of photography, to cinematography, his skill is noticeable. As I have stated, this has never looked any better. That is something that is so amazing about Twilight Time, they honor and preserve film. They don’t just throw out random products. They make sure there products are given a form of perfection or at least higher quality then what is available, and this new outlet for 10 to Midnight showcases that beauty. The audio is crisp to the ears and the video is vibrant. The product works in so many wonderful ways. Loved the extras. The audio commentary is absolutely, a great piece of listening. It gives information on the film that I learned a lot on. Producer Pancho Kohner, casting director John Crowther, and film historian David Del Valle create a wonderful listen to all the aspects of the film. Original Trailer and also radio spots for the film. The very important isolated score alongside some special effects sounds. As I have mentioned the music is done by Robert O. Ragland. Ragland is what certain film lovers would call a genius. Ragland is a true memorable person, or at least his music is. Why you ask, because he created a vast array of B-movie, Cult Film scores throughout his career. He gave the world of B-movies, and lovers of cult, lower class cinema, listening ecstasy, or at least whatever the budget allowed. From 1971’s The Touch of Satan, to 1974’s cheese-tastic Abby. From the original killer bear, 1976’s Grizzly, to the outlandish creature feature 1982’s Q. From the crap-tacular 1985’s Evils of the Night, to 1995’s The Fear, and it’s 1999 sequel, The Fear Resurrection. Whatever the case was, he gave it his all, and added a great listening pleasure to the films, and 10 to Midnight is no different. Twilight Time yet again has graced the movie loving world with another important product. The movie is simply a high class B-movie. It’s violent, suspenseful, dark and mysterious. Twilight Time’s product has done this film justice. They bring it out in all its twisted CULT status glory.